Department of Pre-school Teaching, Faculty of Education, Gazi University, Ankar, TURKEY. Lecturer, Program Education of Physical, Health and Recreation, Faculty of Sports, State University of Surabaya, INDONESIA. School of Health Sciences, Macao Polytechnic Institute, Rua de Luis Gonzaga Gomes, MACAO, SAR. Department of Journalism and Mass Communication, Kuvempu University, Shankaraghatta, Shivamogga, Karnataka, INDIA. Department of Islamic Economics, Airlangga University Postgraduate School, INDONESIA. Department of Education Management, Manado State University; Department of Education Management, Education Sciences Faculty, Manado State University; Department of Building Engineering, Engineering Faculty, Manado State University; Department of Biology, Mathematics and Natural Sciences Faculty, Manado State University, INDONESIA. Department of Elementary Education, Early Childhood Education, Faculty of Education, Gazi University, TURKEY. Jaramogi Oginga Odinga University of Science and Technology, KENYA. 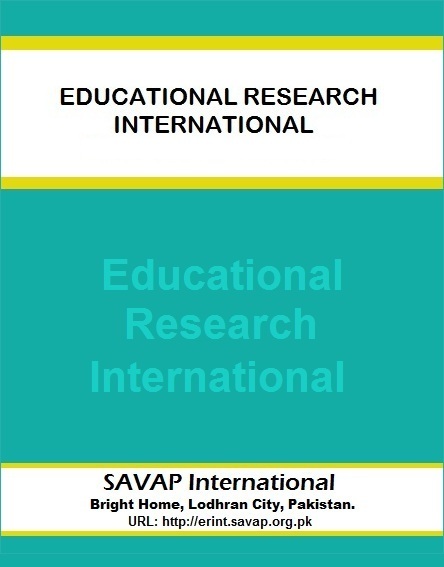 Copyright © 2013-2017 SAVAP International. All right reserved.